Perry was approved by the Senate earlier Thursday by a 62-37 vote. He was sworn in at the White House by Vice President Mike Pence. 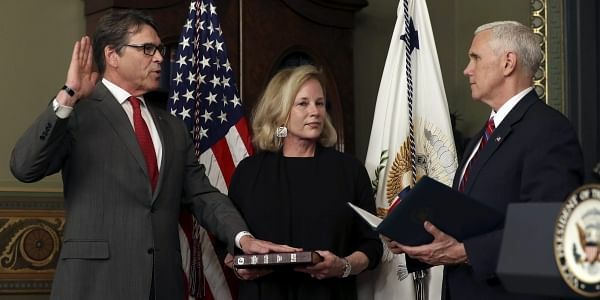 WASHINGTON: Former Texas Governor Rick Perry has been sworn in as President Donald Trump's energy secretary. Perry — who once pledged to eliminate the Energy Department — has repeatedly promised to be an advocate for the agency and to protect the nation's nuclear stockpile. Perry also has said he'd rely on federal scientists, including those who work on climate change. Perry has said he'll work to develop American energy in all forms — from oil, gas and nuclear power to renewable sources such as wind and solar power.